Osaka: , 1795. [The Imperial Collection of Swords]. 12 volumes octavo (255 Ã— 108 mm) . 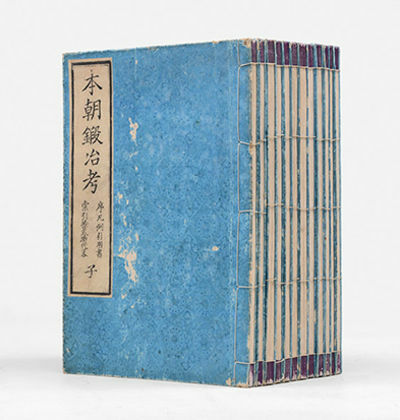 Original sewn-Japanese binding, pale blue relief-patterned light card wraps, calligraphic paper labels. 6 of the volumes profusely illustrated with wood-cuts. First volume with minor scuffing to the front cover, last volume has some worming to margins towards the rear, some soiling and edge-wear to all volumes, otherwise the paper labels are all solid bright and clear, and the contents show just some light toning, but remain tight, bright, clean and unmarked, a very good set First edition thus, extremely uncommon, just one set noted in OCLC, Metropolitan Museum of Art. Essentially a regional survey of sword makers, giving the name of the master swordsmith, his school, and his disciples, illustrated with examples of nakago -tangs - with mei or signatures. Unmarked as such, but from the collection of Prof. Robert M. Lewert. Bob Lewert was a specialist in the immunology of parasitic diseases, Professor Emeritus of The University of Chicago, a Fullbright and Guggenheim Fellow, consultant to the Surgeon General of the U.S. Public Health Service and Department of the Army; and also a life member of the Japanese Society for the Preservation of Artistic Swords (Tokyo) and a director, former chairman and life member of the Japanese Sword Society of the United States. Unusual and highly attractive. 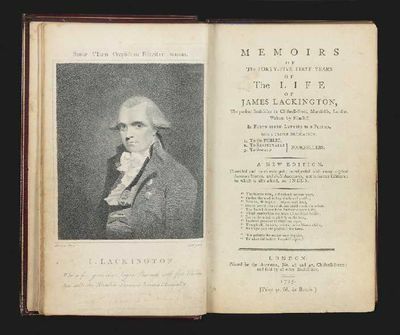 Memoirs of the First Forty-Five Years of the Life of James Lackington, the present Bookseller in Chiswell-street, Moorfields, London. Written by Himself. In Forty-Six Letters to a Friend. With a Triple Dedication. 1. To the Public. 2. To Respectable Booksellers. 3. To Sordid Booksellers. A New Edition, corrected, and much enlarged; interspersed with many original humourous Stories, and droll Anecdotes. Engraved frontis. port. of the author. 540 pp. 8vo, cont. red straight-grained morocco (slightly darkened), flat spine gilt, a.e.g. London: Printed for the Author, 1795. "A New Edition, Corrected and much enlarged; interspersed with many original humourous Stories, and droll Anecdotes, not in former Editions; to which is also added, an Index." Lackington (1746-1815), who started his business career at the age of ten as an itinerant meat pieman, became an apprentice shoemaker four years later. In 1773 he went to London and opened up a bookstall and shoemaker's shop in Featherstone Street, St. Luke's. His exceptional industry and frugality enabled him to become one of the leading booksellers of his time. In 1791 he calculated that he was selling about 100,000 volumes each year. His legendary shop at Finsbury Square in London was named "The Temple of the Muses." Lackington revolutionized the book trade by becoming the first bookseller to refuse to sell books on credit. His cash only approach allowed him to offer books less expensively. Lackington also refused to destroy or discard remaindered books and instead sold them at bargain prices. His memoirs are "the principal source of information about him; in addition to the particulars of his life, the work is full of curious anecdotes and many quotations from a wide range of authors."-ODNB. He retired in 1798 and engaged in a number of charitable activities. I believe this is the final edition to be revised by him. Fine copy, most attractively bound. Faint embossed stamp of a library on frontispiece and title with a small rubberstamp number on verso of title. Half-title lacking. . Travels In Portugal Through the Provinces of Entre Douro E Minho, Beira, Estremadura and Alem-Tejo, in the Years 1789 and 1790. Richmond, Virginia, December 10, 1795. 8.5" x 6.5". "Autograph Letter Signed ""James McClurg,"" 1 page, 8.5"" x 6.5"". Richmond, Virginia, December 10, 1795. Addressed on verso by McClurg to ""Mr. George Simpson / Cashier of the Bank of ye US. / Philadelphia."" Minor flaws. 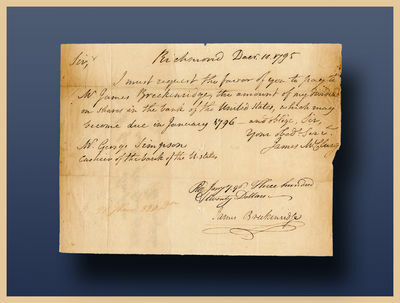 Fine condition.In full, ""I must request the favor of you to pay to Mr. James Breckinridge, the amount of my dividend on shares in the bank of the United States, which may become due in January 1796 - and oblige, Sir. ""Manuscript ""Rec Jany 7. 96. Three hundred Twenty Dollars"" signed ""James Breckinridge"" with flourish.James Breckinridge (1763-1833) represented Virginia in the House of Representatives as a Federalist serving from 1809-1817. In 1781, at the age of 18, he served in Colonel Prestonâ€™s rifle regiment under General Nathanael Greene in North Carolina. While serving in Congress in the War of 1812, he was appointed Brigadier General of the Third Brigade of the Virginia Militia which guarded Richmond and reinforced troops in Baltimore.James McClurg (1746-1823) was a member of Virginia's delegation to the 1787 Constitutional Convention. In Philadelphia, he advocated a life tenure for the President and argued for the ability of the federal government to override state laws. He left the Convention in early August and did not sign the Constitution." Nella Stamperia di Antonio Paci 1795 4to (cm. 25,4), VIII - XLII - 126 pp. con una mappa del territorio rip. f.t. Legatura moderna in mz. pergamena con fili e titolo oro su tassello in pelle al ds. Conservate le copp. originali in cartonato muto. Alcune fioriture sparse, ma buon esemplare in barbe. Lozzi, n.2028: â??Raroâ??. Schmutzer, Jakob Matthias, Zeichner und Stecher (1733-1811). Wien, 14.08.1795 - 1 S. 8vo. Mit eh. Adresse (Faltbrief). "Ob ich mit meinen kleinen Tallen, dem Grosen Wieland Ehre machen kann, muss sich erst Erproben, aber das verspräche ich, die zeit wo Sie die Platte nöthig haben, gewiß zu halten. Dahero Ersuche ich Euer Wohlgebohrn, die gemalte Zeichnung gleich an hero zu schicken, belieben Sie selbe an Herrn Camesini zu adresiren, weillen ich um diese Zeit, mit die Akademieschiller in das Landschaft Zeichnen verreiset binn [.]". - 1762 wurde Schmutzer Schüler von Johann Georg Wille in Paris, der ihn mit der Leitung einer dort für deutsche Schüler eingerichteten Zeichenschule betraute. 1766 kehrte er nach Wien zurück, wurde Direktor der Kupferstichsammlung und beauftragt, eine Schule für Kupferstechen und Zeichnen zu errichten, die im selben Jahr eröffnet und 1768 unter seiner Leitung zur selbständigen Akademie erhoben wurde. Seit 1767 Hofkupferstecher, wurde Schmutzer 1771 Oberdirektor sämtlicher k. k. Normalzeichenschulen. Appel à l'Impartiale Postérité, par la Citoyenne Roland, Femme du Ministre de l'Intérieur ou recueil des Ecrits qu'elle a rédigés, pendant sa détention, aux prisons de l'Abbaye et de Sainte-Pélagie ; Imprimé au profit de sa Fille Unique, privée de la fortune de ses père et mère, dont les biens sont toujours séquestrés. [Philadelphia: Francis Childs, 1795. Broadsheet, 13 1/2 x 8 1/4 inches. Old fold lines, with one small separation. Minor foxing. Very good. Untrimmed. 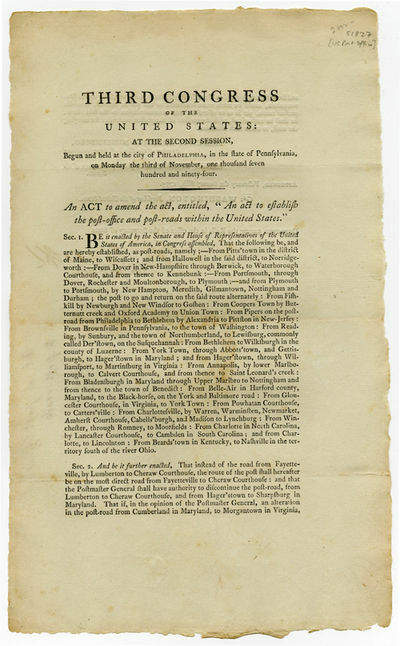 An act passed by the Third Congress creating many new official post roads, and the alteration of several others. These new roads were to run through most of the country, but were concentrated in New England, Pennsylvania, Maryland, and Virginia, with several also connecting the Carolinas. Of note is the establishment of a frontier post road to run from Bardstown, Kentucky to Nashville in the Southwest Territory, incorporated into the Union in 1796 as Tennessee. 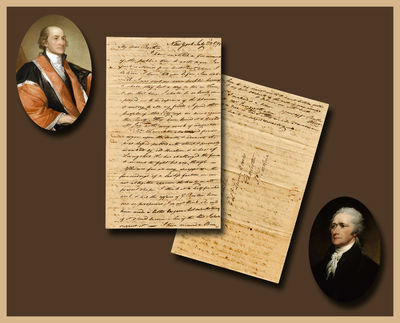 "Approved, February the twenty fifth, 1795," and signed in print by Speaker of the House Augustus Muhlenberg, President of the Senate Pro Tempore Henry Tazewell, and President George Washington. Two states of this imprint are noted. One, Evans 29701, includes a statement of deposition: "Deposited among the rolls in the Office of the Secretary of State. Secretary of State," and is signed by Secretary of State Edmund Randolph. The other, Bristol B9377, is without this statement. This is the former, signed by Secretary of State Edmund Randolph. ESTC notes copies at only four American institutions, and Evans adds another at Library of Congress. Scarce in either format, and particularly rare with the signature of the Secretary of State. Edmund Randolph became the second Secretary of State on Jan. 2, 1794, succeeding Thomas Jefferson, who resigned at the end of 1793. He continued the practice begun in the First Congress of the Secretary of State signing a small number of "official" copies of Congressional acts for distribution to the States and important government officials. After the Third Congress, official acts were no longer signed in manuscript by the Secretary of State. EVANS 29701 ESTC W14572. Abbildung und Beschreibung des Telegraphen oder der neu erfundenen Fernschreibemaschine in Paris und ihres innern Mechanismus. 2. ganz umgearbeitete Auflage. Neues systematisches Conchylien-Cabinet, fortgesetzet durch Johann Hieronymus Chemnitz. Eilfter Band. Uebersicht der Natur in Briefen an einen Reisenden nebst einigen Bemerkungen über den Atheismus in Beziehung auf dessen Verbreitung im neueren Frankreich. Aus dem Englischen übersetzt. 4 Bände. Nürnberg, in der Raspeschen Buchhandlung, 1795. 4to (290 x 2350mm). pp. (24), 310, (2), with engraved title vignette, some text engravings and 41 fine handcoloured engraved plates. Contemporary calf, gilt decorated spine with red and green gilt lettered label (head of spine shaved). The 11th volume, and the final volume published by Chemnitz, of this large and rare iconography on shells is of particular interest as it describes and portrays many shells from New Zealand and Australia collected during Cook's voyages into the Pacific. Below we give the pages where these shells are described (as well as portrayed). Vol. XI: pp. 8, 17, 21, 34, 59, 84, 117, 166, 135, 162, 165, 168, 179, 180, 247, 274, 281.//For example p. 8 'Die Magnificens. Die prächtige Volute... lieget diese Volute alleine in der reichen Conchyliensammlung des Herrn Kunstverwalters Spengler. Er hat davon einige Exemplare aus London bekommen. Jedes hat ihm fünf Guineen gekostet... Ob wir bald mehrere von dieser prächtigen Gattung aus Norfolk zu erhalten das Glück haben werden, wird die Zeit lernen'; p. 21 'Die Südseeische wilde Musik... Voluta Pacifica Solandri'; p. 34 'Aurora. Die Pomeranze... Cypraea Aurora Solandri'; p. 59 'Der Südseeische Kegel... Conus Australis...Es wohnet dieser Kegel in der Südsee, vornehmlich bey Südwallis. Es ist durch Englische Schiffe die von Botanybay hergekommen, in China, an Dänische Seefahrer verkauft worden'; p. 117 'Der Spenglerische Murex... so hat man vor kurzen diese Gattung am Strande von Neusüdwallis entdecket...' p. 162 'Die Südseeische Perspectivschnecke... Tronchus Perspectivus Australis... die von Botanybay nach China gekommen, und einen Theil ihrer Conchylien Dänischen Chinafahrer verkauft...' p. 166 'Die Südseeische Dicklippe... Trochus Labeo Australis... bey Neuseeland sollen die Dicklippen die gemeinsten Schnecken seyn'; p. 179 'Die Sattinpatelle... welche von Neusüdwallis herstammet...'; p. 274 'Das Riesenhorn, Helix Cornu Giganteum... welch auf den Inseln der Südsee und auf Neuseeland wohnet...'; p. 281 'Die Sultanin unter den Hennen, Helix Gallina Sultana... Es wohnet diese seltene Schnecke auf Neuseeland'./Many more shells of the South Seas and the Pacific are described and portrayed in this volume./Many of the shells come from the cabinet of Lorenz Spengler of Copenhagen (ex Museo Spengleriano). His cabinet contained many Cook related items and Spengler was a regular customer of Humprey, 'who wrote to Spengler on 15 October, 1775, apologizing for the delay in sending him shells and explaining that he needed to be on hand to take care of transactions on the return of the 'Resolution" (Andrews, The Southern Ark p. 48). /"Friederich Wilhelm Martini, a Hamburg physician, conceived the idea of publishing the first large-scale encyclopaedia of shells illustrated with hand-coloured plates. His ambition was to describe and portray every kind of shell known, an ambition virtually impossible to fulfil, as others have discovered since. No sooner was the third volume of the 'Neues Systematisches Conchylien-Cabinet' in print that its author died, in 1778. Publication was continued by Johann Hieronymus Chemnitz, a Danish clergyman who, between 1779 and 1795, added a further eight volumes" (Dance, Shells p. 24). //Nissen ZBI, 2722; B.M. (Nat. Hist.) III, 1252. London : J Johnson, 1795 A good copy of this scarce title, with 46 superb hand coloured plates. William Lewin (1747-1795) intended this work to be the first volume of 'The Insects of Great Britain' series. However he died in 1795 with only this volume completed. This is the rare first issue which has the series title page and ends 'End of Volume I'. The second issue amends the title to the 'Papilios of Great Britain' making it stand-alone. The contents are in very good clean condition. We have rated the volume as 'good' because the binding appears to be the original publisher's boards with a later tape covering as the spine. This tape is splitting, which offers the opportunity to rebind to taste. The work has been priced to reflect this. Contents: title pages in French and English; half title page 'The insects of Great Britain'; text in French and English with 46 hand coloured plates; index 3pp. Les Aphrodites ou fragments thali-priapiques pour servir à l'histoire du plaisir. Philadelphia: Dobelbower, Key and Simpson, 1795. First American Edition, 1st Printing. Hardcover. Very good. 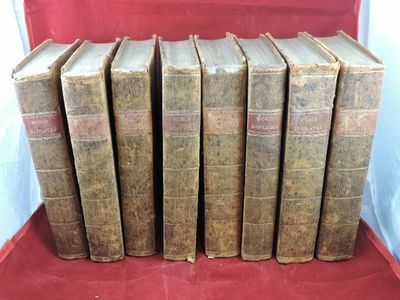 Complete set of 8 vols. These books were part of the original library of Joshua Humphreys (1751-1838) who designed and built many early American ships including the frigate USS Constitution. They are signed by him (1808) in every volume (title page, introduction or free end papers). Tan calf leather bindings with gilt numbers, gilt titles on red leather panels and gilt lines on flat spines. Text blocks tight and unmarked with light foxing, toning and plate bleed through. Vol. I all plates present, corners bumped, headband missing, tail of spine chipped. Vol. II all plates present (including Beavers Building Their Huts), corners bumped, headband missing. Vol. III appears to have a binding error, p.241-320 missing yet binding is the correct size for test block. Most (missing Sir Henry Middleton p.441) plates present, corners bumped, headband missing. Vol. IV also appears to have a binding error, p.73-168 missing yet binding the correct size for text block. Most (missing Maldavians p.160) plates present, corners bumped, head/tail of spine chipped. Vol. V all plates present, corners bumped, headband missing, tail of spine chipped. Vol. VI also appears to have a binding error, p.81-152 missing yet binding again the correct size for text block. Most (missing Avenue at Schiras p.104) plates present, corners bumped, tail of spine chipped. Vol. VII all plates present, corners bumped, upper joint starting, wear to head/tail of spine. Vol. VIII All plates present including the plates of Captain Cook's travels (old tape repair to verso) and his death. Signed by Captain Humphreys on title page and first page of introduction. Corners bumped, wear to head of spine. OCLC 20033640. Leyden, Amsterdam, and The Hague: Honkoop, Allart and Van Cleef, 1795-1809. First Edition in Dutch n. This is a very desirable copy, with remarkably well-preserved text and plates, of the extremely uncommon first Dutch edition of the collected accounts of the three great voyages by James Cook, voyages of exploration that provided the world for the first time with a virtually complete understanding of the Pacific Ocean and Australia. The son of a field worker, Cook (1728-79) began his career at sea as a ship's apprentice. Joining the British navy in 1755, he saw action against the French off the Canadian coast, and surveyed the shores of Newfoundland and Labrador. Having educated himself in mathematics and astronomy, Cook was made lieutenant and put in charge of a scientific expedition that reached Tahiti in 1769, and that explored New Zealand and Australia, the first of his three expeditions circumnavigating the globe. In the course of his second circumnavigation, he was at sea for more than 1,000 days, and saw the ice of Antarctica. For his third and most famous voyage, his crew set sail in two ships, and while proceeding northeast from Tahiti with the aim of discovering a Northwest Passage, they came upon the Hawaiian Islands. There, one of his rowboats was stolen, and Cook responded by seizing the person of the Hawaiian king to compel the boat's return. In the fracas that ensued, Cook received a fatal blow. Our set contains the life of Cook and the first voyage (1768-71) in Volumes I-III, the second voyage (1772-75) in Volumes IV-VII, and the third voyage (1776-80) in Volumes VIII-XIII. Peddie says that the Dutch edition, which is probably based on the German printing of 1781, is seen with an atlas volume, but the present set has all of the plates bound in, as is often the case. The plates are printed on especially thick, textured paper, and this copy has none of the expected tears at plate folds. ABPC lists this item just once since 1975 (though it does show up from time to time at Dutch or Australian auctions not monitored by ABPC). When it does appear, it is almost always in terrible shape.. 222 x 133 mm. (8 3/4 x 5 1/4"). 14 volumes (13 volumes of text, plus index). Translated by J. D. Pasteur. First Edition in Dutch. Contemporary half calf over marbled boards, spines with orange morocco titling label and circular green morocco volume label (one volume expertly rebacked, using the original backstrip). WITH 199 ENGRAVINGS, including 13 title pages, 52 folding maps by C. van Baarsch, and 134 plates (mostly folding) by J. S. Klauber. First title page with paste-over at bottom presumably indicating a (late 19th century?) bookseller (this paste-over torn away in second volume and obscured by a second paste-over in the other volumes). Beddie 52; Tiele 268. Some chafing and abrasions to paper covers, a small chip at the top of one spine, minor wear to joints, half the corners worn, but all of the volumes solid, and nothing approaching a serious external condition issue. Separation at hinges on all but two volumes (without any looseness), a few half titles vaguely soiled, the single-page plates faintly offset, two volumes with inoffensive freckled foxing to plate margins, but still AN EXCEPTIONALLY FINE SET INTERNALLY, the plates especially rich, and the text unusually bright, fresh, and clean. 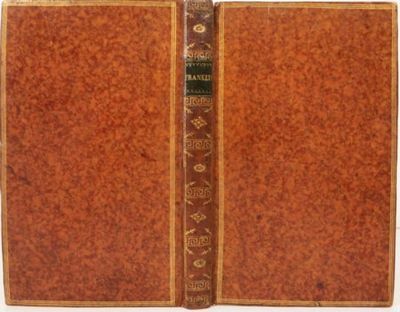 This is a very desirable copy, with remarkably well-preserved text and plates, of the extremely uncommon first Dutch edition of the collected accounts of the three great voyages by James Cook, voyages of exploration that provided the world for the first time with a virtually complete understanding of the Pacific Ocean and Australia. The son of a field worker, Cook (1728-79) began his career at sea as a ship's apprentice. Joining the British navy in 1755, he saw action against the French off the Canadian coast, and surveyed the shores of Newfoundland and Labrador. Having educated himself in mathematics and astronomy, Cook was made lieutenant and put in charge of a scientific expedition that reached Tahiti in 1769, and that explored New Zealand and Australia, the first of his three expeditions circumnavigating the globe. In the course of his second circumnavigation, he was at sea for more than 1,000 days, and saw the ice of Antarctica. For his third and most famous voyage, his crew set sail in two ships, and while proceeding northeast from Tahiti with the aim of discovering a Northwest Passage, they came upon the Hawaiian Islands. There, one of his rowboats was stolen, and Cook responded by seizing the person of the Hawaiian king to compel the boat's return. In the fracas that ensued, Cook received a fatal blow. Our set contains the life of Cook and the first voyage (1768-71) in Volumes I-III, the second voyage (1772-75) in Volumes IV-VII, and the third voyage (1776-80) in Volumes VIII-XIII. Peddie says that the Dutch edition, which is probably based on the German printing of 1781, is seen with an atlas volume, but the present set has all of the plates bound in, as is often the case. The plates are printed on especially thick, textured paper, and this copy has none of the expected tears at plate folds. ABPC lists this item just once since 1975 (though it does show up from time to time at Dutch or Australian auctions not monitored by ABPC). When it does appear, it is almost always in terrible shape. Travels in Portugal; Through the Provinces of Entre Douro e Minho, Beira, Estremadura, and Allem-Tejo, in the Years 1789 and 1790. Consisting observations on the manners, customs, trade, public buildings, arts, antiques &c. of that Kingdom. Illustrated with plates. Hesperus, oder 45 Hundsposttage. Eine Biographie. Mit 3 gestochenen Titelvignetten von F. C. Krüger. Erstes bis drittes Heftlein in 3 Bänden. Le Tribun du Peuple, ou le Défenseur des droits de L?Homme [Der Volkstribun. Der Verteidiger der Menschenrechte], No. 34: ?Du 15 Brumaire, l?an 4 de la République? von/par Gracchus Babeuf. Duel! Signer Lewis Morris' son, Staats Morris, vividly describes New York's angry reaction to the news of Jay's Treaty, and Alexander Hamilton's part in it. Foreshadowing Hamilton's demise, Morris reports his challenging to a duel of Commodore Jonathan Nicholson! Madrid, Imprenta de la Viuda de Josef García, 1795 - Folio, +64 p + XLIX láminas. Pasta española algo rozada, tejuelo, ruedas doradas en lomo, cortes tintados. Interior en buen estado, salvo puntos de óxido esporádicos. Láminas calcográficas a toda página, algunas plegadas. Bibliografía de Arquitectura en España: "., representa la introducción de un nuevo concepto en los cortes de cantería en España. [.]. es una gran aportación lexicográfica además de la gráfica en la que José Asensio volvió a grabar las láminas de la edición francesa con títulos e indicativos en castellano"
Paris: Ant. Aug. Renouard, 1795. The first edition printed in France. Some rubbing to joints, but quite sound, very good or better. The first edition printed in France. 12mo. (vi), 181p, (ii, Epitaph), blank, (i, contents). Text in English and French. 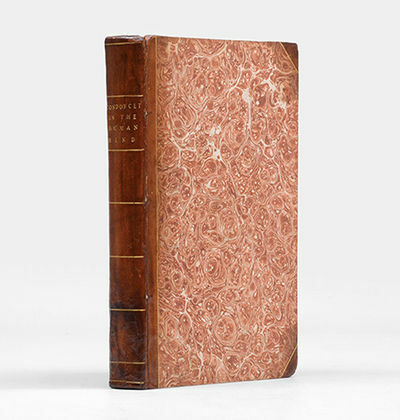 Bound in contemporary mottled calf with marbled endpapers, a.e.g., the flat spine with black title label and period gilt ornamentation, the covers with triple fillet borders, dotted ruled board edges, dentelles. Additional titles: LETTRES DE FRANKLIN. DIALOGUE ENTRE LA GOUTRE ET FRANKLIN. QUELQUES MOTS SUR l'AMERIQUE. AVIS A CEUX QUI VOUDROIENT ALLER S'ETABLIR DANS CETTE CONTREE. Dr. FRANKLIN'S EPITAPH. First appearance of the "Dialogue Entree la Gout et Franklin". "Beautifully printed. The letters to Franklin above mentioned are private, and addressed to Madame**, dated Passy, 1778 and 1779" (Sabin 25596). AESOP. Samuel Croxall, translator and editor. Fables of Aesop and others. Newly done into English. With an Application to each Fable. London: Published by Robert Andrew Riddell, 1795. Colour-printed aquatint. Full inscription at bottom of print reads: 'To the Most Noble George Marquis of Tweedale & this View of the Valley of Glencoe is respectfully Inscribed by His Lordships most obedient Humble Servant.' Very good condition apart from some light soiling, minor foxing, and several small losses in the margins. A fine plate of the scenic mountains of Glencoe in the Highlands of western Scotland. 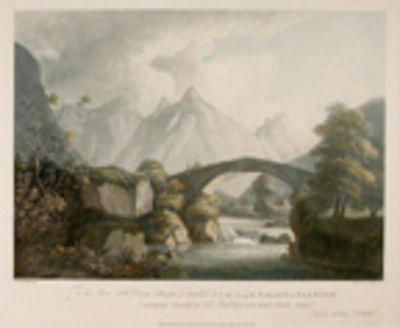 This beautiful image is most likely part of a pair prints depicting Glencoe that Riddell published in 1795. Robert Andrew Riddell was a landscape painter, who primarily depicted the scenic topography of Scotland in watercolour. He exhibited one of his works at the Royal Academy in 1793 and gave several of his paintings to the Scottish poet Robert Burns. Archibald Robertson (1765-1835) was a Scottish artist, very talented in both painting and printmaking, who immigrated to America around 1796 (soon after this print was published) where he had a successful career painting miniature portraits on ivory. He also produced a number of topographical prints of New York City places: "Collect Pond" of 1798 among others. A number of his miniature portraits are in the collection of the Metropolitan Museum. This early work of the Highland valley Glencoe is an extraordinarily fine landscape print, aesthetically superior to Robertson's American prints, and a fine example of colour printed aquatint. Entwicklung der Ursachen welche Frankreich gehindert haben zur Freiheit zu gelangen. Mit Anmerkungen und Zusätzen (übersetzt) von Friedrich Gentz. 2 Bände. XVI, 368 S.; 350 S., 1 Bl. Graublaue Pappbde d. Z. (Rücken berieben) mit Rückenschild. Deckel mit gezeichn. Schweizer Lokalwappen als Supralibros in den Farben Rot-Gelb-Silber-Braun. 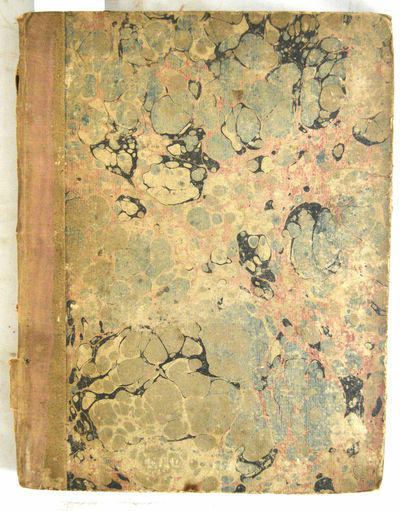 London: Printed for J. Johnson,, 1795. being a posthumus work of the late M. de Condorcet. Translated from the French. Octavo (205 x 126 mm). 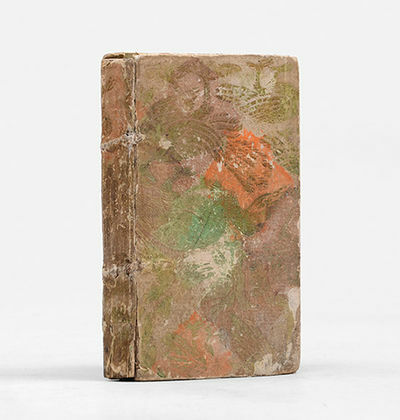 Contemporary half calf, marbled sides, spine gilt in compartments, titles to spine gilt, edges sprinkled green. Contemporary ownership signatures to front pastedown and head of title page. Extremities slightly rubbed and worn, joints cracked but firm, endpapers lightly tanned, occasional minor spotting to text block. A very good copy. First edition in English of Esquisse d'un tableau historique de progrÃ¨s de l'esprit humain, originally published earlier the same year in Paris. "In the Esquisse ... Condorcet traces the history of man through epochs, the first three covering his progress from savagery to pastoral community and thence to the agricultural state. The next five span the growth of civilizations, and knowledge down to Descartes, and the ninth describes the revolution of Condorcet's own lifetime, from Newton to Rousseau. The prophetic view of the tenth epoch shows Condorcet at his most original. He forecasts the destruction of inequality between nations and classes, and the improvement, intellectual, moral and physical, of human nature" (PMM). Philadelphia, PA: Bioren & Madan, 1795. 1st Edition. Leather Bound. Very Good/No Jacket (as issued). 16mo 5.75 - 6.75'' tall. "Corrected From the Latest and Best London Editions, With Notes By Samuel Johnson, L.L.D. to Which Are Added, a Glossary and the Life of the Author. First American printing of the works of Shakespeare. Imbellished with a striking Likeness from the Collection of his Grace the Duke of Chandos. 1st American Printing. Volumes 1,3,4,5,6,7 ONLY of 8 volume set. 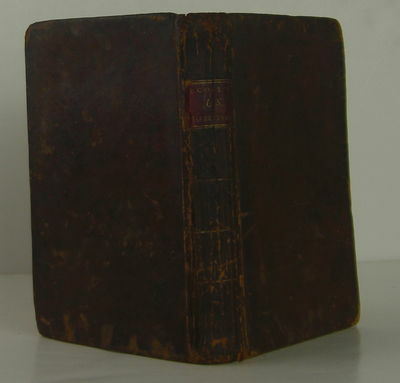 Full leather bound, boards undecorated, spine has deep-red title band and black edition band, with gold lettering, stars and bands. Plain endpapers and page edges. Volume One has frontispiece portrait of Shakespeare. All title pages state 'First American Edition', with a date of 1795 or 1796. Some spine ends have small leather loss, to level of top or bottom of text block. All hinges are intact but very tender, with some cracking along spine/board borders. Page ends fairly clean with only minor age toning. Text blocks are firmly bound. Small ancient previous owner name on all title pages. Many pages clear of foxing, but light foxing or tanning throughout. . ISBN: B001NLYCDQ. Catalogs: Poetry:. The scholar armed against the errors of the time. Or, a collection of tracts on the principles and evidences of Christianity, the constitution of the Church, and the authority of civil government. In two volumes. ..... The whole intended for the information and assistance of young students in our schools and universities; and published by a Society for the Reformation of Principles. London: F. and C. Rivington. 1795. Two vols., 8vo., (10) + xi + (3) + 576 and (4) + 525 + (1)pp., with the mid-19th century armorial bookplates of John Bowles >on pastedowns, contemporary tree calf, sometime rebacked, spines gilt and labelled. A fine copy in a pleasing binding. Second edition*: scarce. 'Jones of Nayland (1726-1800), Anglican clergyman and religious controversialist, and his associates had early on after 1789 been inspired by the French Revolution to heightened energy in defence of the Church against what they saw as anarchy, irreligion, and Antichrist. 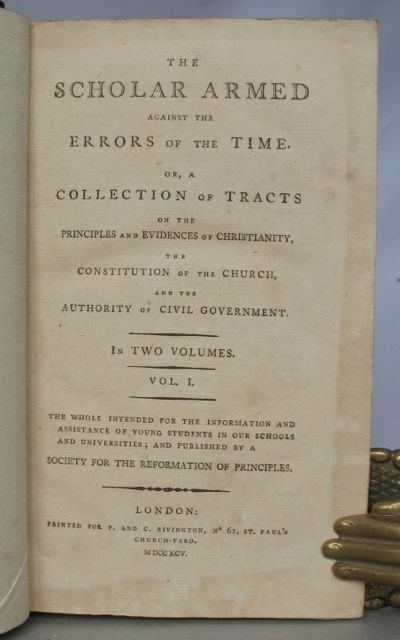 In 1792 Jones founded the Society for the Reformation of Principles to promote high-church values, which resulted in the publication of the British Critic>. He edited in 1795 an expanded version of a collection of tracts previously published fifteen years earlier and now entitled The Scholar Armed against the errors of the time>. ..... [Jones's] career illustrates the ways in which the high-church mentality, with its connotations of sacerdotalism and respect for divinely constituted authority, was more influential in the 18th century than has sometimes been appreciated. The threats to order posed by the American War of Independence, and even more by the French Revolution, gave Jones and his contemporaries a wide readership.' [G.M. Ditchfield in ODNB]. * This 2nd ed. (the 1st was 1780) is much enhanced by Jones's detailed proposals for the formation of the Society for the Reformation of Principles. They are set out here in full (pp. i-xi) in three papers and a postscript severally dated January 1, 1792, June 11, 1792, and January, 1795. There were to be 'acting' [i.e. active] members, a committee, and annual subscribers. Messrs. Rivington, the London publishers, were to accept subscription. Legge Criminale Del di 30 Agosto 1795. Gaetano Cambiagi Stampator Granducale  in 4° cartonato Incisione al frontespizio con lo Stemma del Granduca di Toscana. L'autore, di famiglia originaria del Lussemburgo, fu segretario granducale fra la fine del XVIII e gli inizi del XIX secolo; fu ammesso al patriziato fiorentino nel 1792. Proposta per una Legge che con certezza punisca i criminali; tanta benevolenza introdotta con la Legge del 30 Novembre 1786 ha di fatto aumentato, secondo l'autore, il numero dei crimini. Un seguace del Beccaria. Segue di pagine 48, stesso Stampatore, , il testo della legge criminale [30 Novembre]. Bell'esemplare stampato su carta pesante. Molto raro. Bailey, 1795 First edition, with all maps present (19 original maps). Very good, recased with original boards and a new leather spine. Housed in a custom-made collector's slipcase.. 1st Edition. Hardcover. Very Good. Le deche di Tito Livio padovano delle istorie romane, tradotte nella lingua toscana da M. Jacopo Nardi. Venezia; presso Giacomo Storti 1794 - 1795 - 6 voll. ; in 16°; pp. 585; 490; 511; 488; 458; 456; leg. in tutta pergamena con tassello e fregi al dorso; tagli a spruzzo. In coda all'ultimo volume: "Tavola delle cose più notabili contenute nella presente opera"
Lehrbegrif der Maschinenlehre, mit Rücksicht auf den Bergbau. 2 Bände. Coppie della Matricole de Cittadini di Trento, con una serie di Consoli, che d&#146;anno in anno sono stati elletti al Magistrato Consolare di Trento, incominciano dall&#146;anno 1545 con l&#146;agointa delli collegiaqti dall&#146;anno 1530. 1795 - Il manoscritto raccoglie in maniera ordinata ed organica l&#146;elenco dei Consoli eletti di Anno in Anno al Magistrato Consolare della città di Trento dall&#146;anno 1545 (7 momi per ogni anno in riquadro) fino al 1795. Inoltre elenco con date di nomina e di incarito dei dottori dal 1530 al 1788 e dei notai dal 1530 al 1788. Completano il documento alla prime ed alle ultime carte alcune trascrizioni di documenti in latino e volgare. Alla penultima carta albero genealogico della famiglia Nardelli con stemma nobiliare in rosso e oro. Interessanto documento compilato in bella grafia d&#146;epoca. Formato: , 57 c., 31 cm, cart. Buono, ordinari segni d&#146;uso e del tempo. "Plan Nouveau & très exact de la Ville d´Amsteldam. Nieuwe Platte Grond der Stad Amsteldam"'Kopergravure vervaardigd door C. van Baarsel in 1795, gecorrigeerd en gedrukt van twee platen in 1820 bij Mortier, Covens en Zoon. Later met de hand gekleurd. Afm. (voorstelling): 54,5 x 94 cm.Uitgeverij Mortier, Covens en Zoon is waarschijnlijk in 1794 begonnen met het vervaardigen van deze kaart. Hij kwam gereed tijdens het eerste jaar van de Bataafse Republiek (1795-1801). Het was een staatsvorm die de voormalige Republiek der Zeven Verenigde Nederlanden met hun Generaliteitslanden bestuurde. In de aanloop hiertoe bezette het Franse Noorderleger onder commando van brigade-generaal Charles Pichegru op 19 januari 1795 Amsterdam. Via en fluwelen revolutie werden de zittende regenten vervangen door bestuurders met Franse sympathieën.Er volgenden verschillende uitgaven van de kaart, met telkens kleine veranderingen in de decoraties of het kaartbeeld die de woelige geschiedenis van ons land weerspiegelen: de Bataafse tijd, de jaren van koning Lodewijk Napoleon, de jaren van inlijving bij het Franse keizerrijk onder Napoleon en de eerste jaren daarna. Zo heet op dit exemplaar uit 1820 de Dam weer Den Dam en niet meer het Revolutie Plein of Plein Napoleon, heet "t Burgerplein weer Koningsplein is het stadhuis inmiddels paleis en is de waag op de Dam inmiddels afgebroken.Prijs: â‚¬ 3.450,- (incl. lijst).